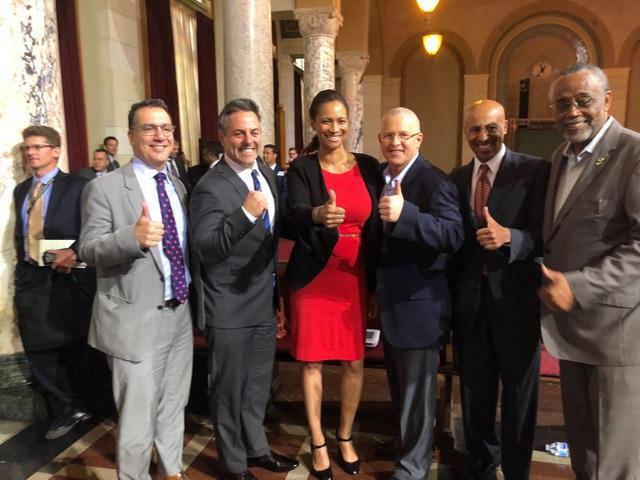 Left Image: The unanimous City Council vote for approval of the Automated People Mover contract; Right Image (l-r): Councilmember Bob Blumenfield, Councilmember Joe Buscaino, Los Angeles World Airports (LAWA) CEO Deborah Flint, Councilmember Mike Bonin, LAWA COO Samson Mengistu and Councilmember Curren Price celebrating the unanimous approval. 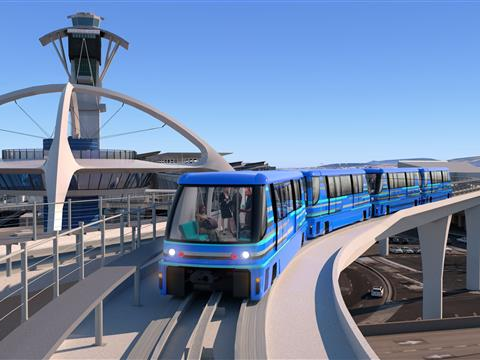 “Making LAX the most passenger-friendly airport means bringing modern and reliable public transportation to the terminals,” said Mayor Eric Garcetti. “The Automated People Mover is a historic investment in our airport and city, and the project’s development moves us closer to delivering the world-class experience travelers expect and deserve." Significant progress has been made over the last 12 months from both a design and construction standpoint. 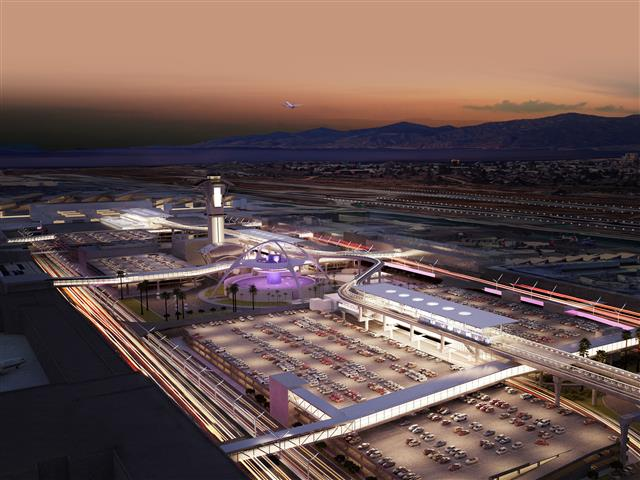 In the last year, LINXS reached commercial close and financial close with unanimous LAWA Board of Airport Commissioners (BOAC) and City Council approval. Notice to Proceed with construction activities was also given by LAWA. 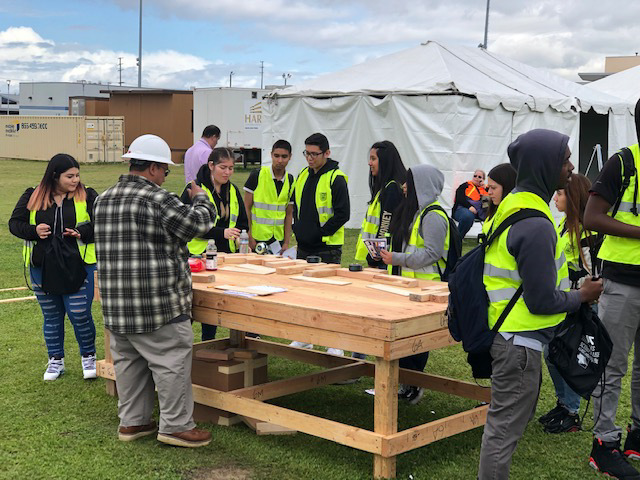 Design of the project elements has been well under way and the 2.25 mile elevated guideway alignment design has been finalized. In the last year, the Inclusivity Program has committed $168.4 million in contract values for qualified, local, small and diverse businesses, and LINXS is slated to award more than $550 million in subcontracts to local, small and disabled veteran-owned business over the life of the project. In addition, 38.89% of LINXS’ contracts achieve inclusivity goals, far surpassing the 30% requirement for the project. 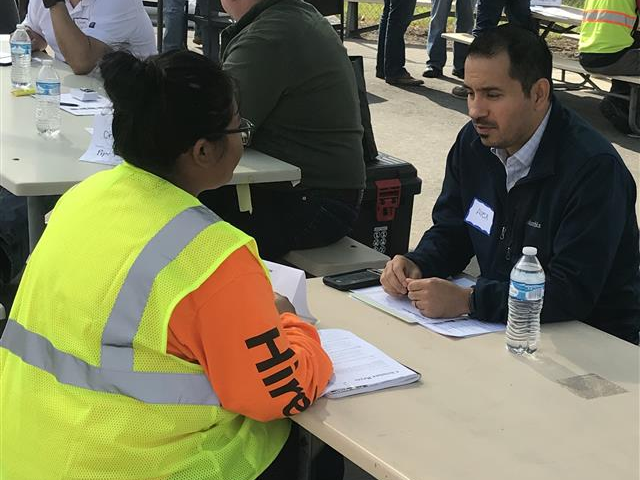 Left image: A potential construction worker meets with a LINXS representative; Right image: LINXS takes part in Construction and Associated Careers Awareness Day. 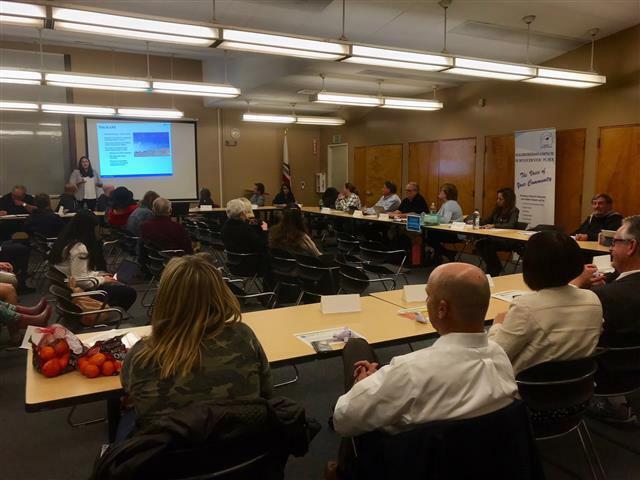 Both the LAWA and LINXS’ communications teams have been hard at work out in the community, providing presentations on the project to a multitude of organizations and business leaders. Since contract approval, the teams have provided upwards of 100 presentations to more than 3,000 individuals. 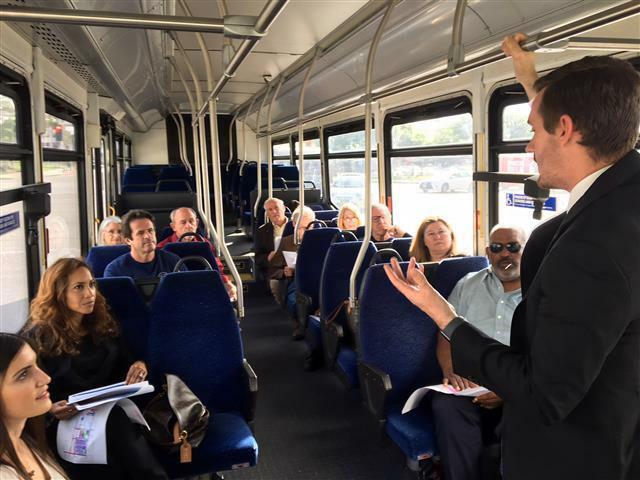 Left image: A LAMP presentation at a community meeting; Right image: Communications team leading a bus tour of the LAMP project future locations. 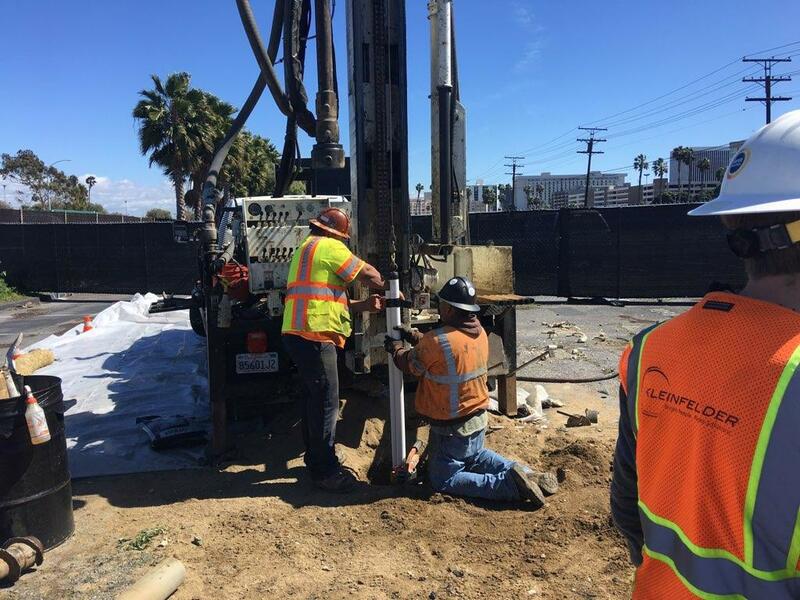 Construction over the last year has consisted of underground utility investigations, allowing for the assessment of pavement and soil conditions for the entire footprint of the system. 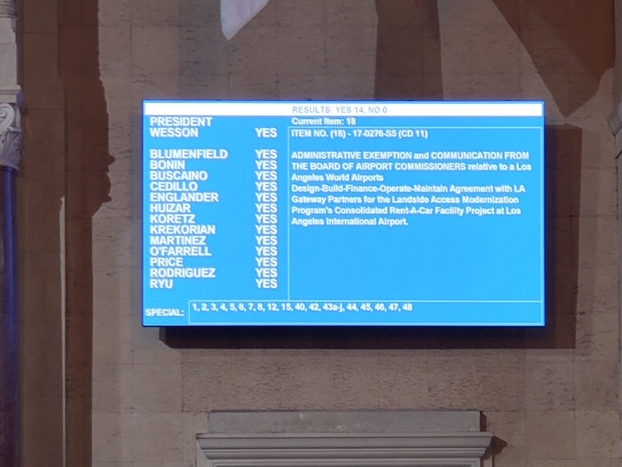 Most of this work has occurred in the LAX central terminal area and surrounding streets and will help set up the beginning of guideway and station work in the summer of 2019. The LINXS team also successfully relocated the Parking Structure 3 exit booth plaza, which created automated parking payment options for the first time at LAX. 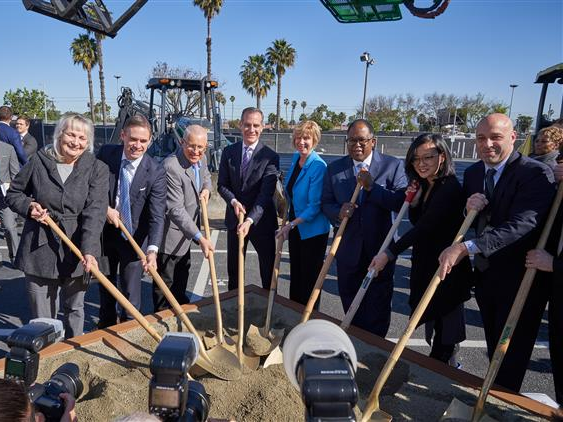 On March 14, 2019, Los Angeles Mayor Eric Garcetti presided over a ceremonial groundbreaking as elected officials, community members, stakeholders and the airport came together to kick off the next phase of the project. In the coming months, the column foundations along the guideway path will begin to be laid, while construction of the APM Maintenance and Storage Facility will commence. Several structures including the bridge connecting Parking Structures 3 and 4, the Center Way ramp and the former Raytheon hangar will also be demolished to make way for construction of the guideway and stations. Left image: Board of Airport Commissioners Vice President Valeria Velasco, Board of Airport Commissioners President Sean Burton, Councilmember Mike Bonin, Mayor Eric Garcetti, County Supervisor Janice Hahn, County Supervisor Mark Ridley-Thomas, Board of Airport Commissioner Bea Hsu and Board of Airport Commissioner Gabriel Esheghian officially break ground on the APM project; Right image: Testing of soil for future construction. The APM train system with six stations in total, will connect the terminals to new off-site parking facilities, new drop-off/pick-up locations, a Consolidated Rent-A-Car (ConRAC) facility and will provide the long-awaited connection to the regional light rail system. End-to-end, a ride lasts 10 minutes and there will be a new train pulling into a station every two minutes. The APM project will be complete in 2023 and is the cornerstone of theLAMP, which also features the ConRAC, Intermodal Transportation Facilities, as well as new and improved roadways. For all construction impacts, renderings of the project and more information on the APM project, visit FlyLAX.com/ConnectingLAX. Individuals can also subscribe to receive email updates online. Left image: Rendering of the Central Terminal Area when APM is completed; Right image: The APM train on the elevated guideway as it curves around the iconic Theme Building.